Use Spacer 6228 to increase cushion height to 100mm / 4"
Increases cushion height to 100mm / 4"
116mm x 90mm / 4.57" x 3.54"
220mm x 87mm x 1.5mm / 8.66" x 3.43" x 1/16"
Warning Label Dimensions: 114.3mm x 146.05mm / 4.5" x 5.75"
Warning label dimensions: 146mm x 222.25mm / 5.75" x 8.75"
Heavy Duty 152.4mm / 6" Padlock Hasp. Large Surface Mount Twist Latch. Flat Cam. Spring-Loaded. 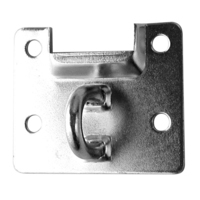 Surface mount twist Latch protector plate with protective ridges. For use with Large Twist Latches. Large Surface Mount Twist Latch 7568 Pre-Riveted into 2017 protector plate with protective ridges. Large Surface Mount Twist Latch. Large Surface Mount Twist Latch. Flat Cam. Large Surface Mount Twist Latch. Padlockable. Spring-Loaded. Large Surface Mount Twist Latch. Spring-Loaded. Medium Twist Latch. Spring Loaded. Small Surface Mount Twist Latch. Flat Cam. Spring-Loaded. Exposed Mounting Hole. Small Surface Mount Twist Latch. Padlockable. For use with wooden crate panels 18mm / 11/16" thick. Heavy Duty Surface Mount Catch Plate. For use with 1097 Draw Latch.